Christmas Bazaars, Boutiques, and Etc. It's the season for Christmas Bazaars, Boutiques, Crafts Fairs, Open Houses, and Etc. You can definitely count on finding a bunch of local ones in Hollister and abouts. Some are fundraisers, while others are not. Here's a list of some that are happening this week. We missed the first few floats, but we were fortunate to be there to see a mutt of a terrier steal the show away from the Sheriff’s float. The little dog stubbornly sat in the middle of the street or pranced precariously close to and around the sheriff’s car as it slooooooowly drove along, with the Grinch hanging out of its back window. He was a dog that would not be caught, at least right away. At one point, he was surrounded by several people. The dog knew how to stop and go. He had them all in his hands. He had all of us who were hanging around on that that block in his hands as well. When we heard clapping and hurrahing at the end of the block, we knew the chap was caught. 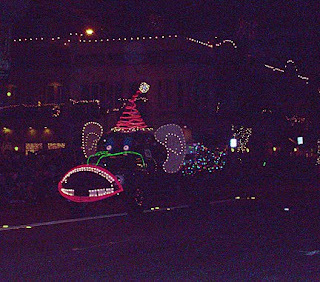 The theme for the parade was “All I Want for Christmas....” I wouldn’t mind having that parade-stopping dog. Is it just me, or are Christmas decorations going up even sooner? 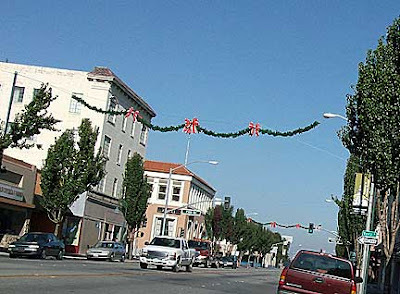 I noticed the green garlands stretched above San Benito Street on Sunday morning. As we sped by the lawn in front of the parking garage, I saw that Santa’s Village was up as well. The Hollister Downtown Association is getting ready! 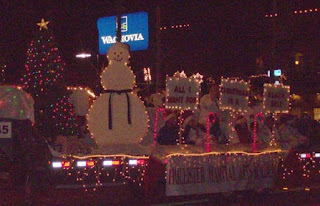 By this Saturday evening, November 29, downtown Hollister will be transformed for the annual “Lights on Celebration.” The trees will be lit along the main street, between South and Forth Streets, and the street will be lined with people as well to watch the parade of floats and cars and people waving and smiling from them. 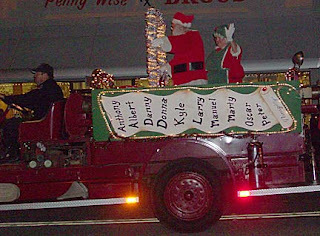 And, of course, bringing up the rear of the parade will be Mr. and Mrs. Santa Claus. 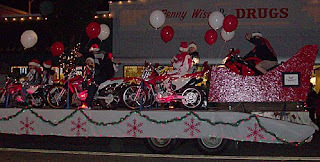 The theme for this year’s parade is “All I Want for Christmas.” It will start at 5:30. There’ll be live entertainment happening before and after the parade, too. Stores will be also be open for the browsing and buying. For me, the best part about the night is hanging out after the parade. After the last float goes by, people pile out from the sidewalks into the center of the street. Folks walk up and down the closed street, checking out the music, greeting acquaintances, and yakking and laughing it up with friends and family. That's worth the Christmas decorations being put up seemingly earlier each year. So, how many of you identified the thing or place in Monday’s photo? Forgot what it looked like. Scroll down or click here, and then come back. See. They are industrial fans at the cannery on the corner of East and Hawkins streets. Once upon a time, there used to be two canneries—Fairview and Hollister—one on each side of South Street. I don’t recall which was where. For the longest time, these canneries made up the biggest non-farming industry in Hollister—for all of San Benito County for that matter. The majority of the jobs, like the farming ones, were seasonal. Each cannery went through several owners, going from the original locals to different corporate canning companies. The Hollister cannery eventually became San Benito Foods, while Fairview became Tri-Valley Growers. 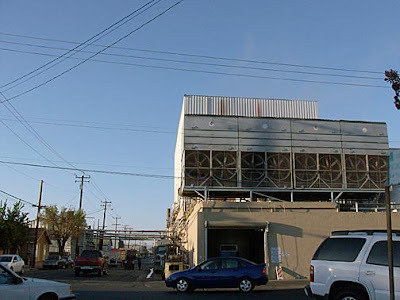 In the 1990s, Tri-Valley Growers closed and San Benito Foods took over its buildings and machinery. San Benito Foods cans different tomato products. In my ancient days, the two canneries also processed spinach, peaches, and apricots. Maybe other stuff, I don’t know. I often wondered where the canned products were sold. I’ve never tasted them. 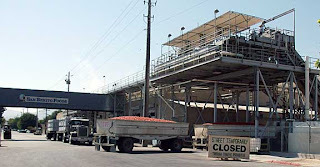 I read at the San Benito Foods Web site that their canned tomatoes are famously delicious. I wonder where. Maybe if I’m ever there, I can buy a can and find out for myself just how awesome they taste, if they do. I’ll let you know in a couple of day. Maybe. In the mean while, for those of you who are familiar with Hollister, take a guess. It was bound to happen. I would take a photograph or two of one of my favorite local haunts as a kid—the Calvary Cemetery. We moved next to the cemetery when I was a fourth grader. We lived on El Camino Paraiso. The English translation: The Heavenly Road or The Road to Paradise. 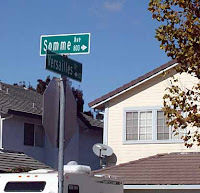 I always thought whoever named the street had a wonderful sense of humor. Or, he was just perverse. Since my deceased sisters were buried in the cemetery, my family visited it often. As I got older, I found myself pedaling my bike through the cemetery on my own. Where else could I find peace and quiet to think? Today, the remains of my dad and a few other relatives and friends of the family are also there. So, I continue to pop over now and then. I no longer live next to the cemetery, but it’s still only a few minutes away. 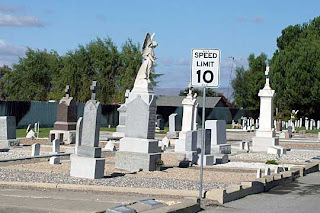 San Benito County has several cemeteries. Not such a big deal until I consider that the population was about 18,000 when I was a teenager, many years ago. Currently the population is around 56,000. Only three cemeteries may actually be in use, but what do I know. If you want to know more about some of the other cemeteries in this county, check out these links. Those interested in genealogy will be happy to know that some of these web sites provide a listing or database of the deceased. 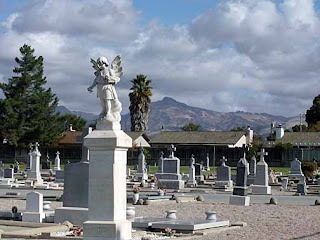 Calvary Cemetery serves the local Catholic Church parishes in Hollister and Tres Pinos. I.O.O.F. Cemetery belongs to the Oddfellows Lodge. I understand that many of the old-time county movers and shakers are buried there. San Juan Bautista (or Larios) Cemetery is up on a hillside, just outside of the village. Mission Cemetery at San Juan Bautista Mission is said to have over 4,000 remains of local natives (like in Indians) and Europeans buried there. 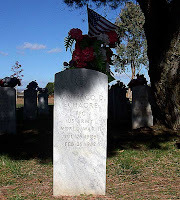 San Benito County Cemetery is described as being a potter's field. 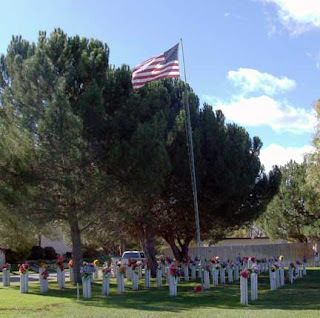 Cherry Hill Cemetery is between Paicines and Mercey Hot Springs. Pinehill Cemetery is way down in the southern part of the county, in the Bitterwater area. 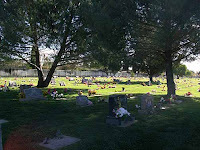 San Benito County Cemeteries, is a list by ePodunk.com, which also provides directions to the places. Versaille. Somme. Verdun. Argonne. Trieste. Marne. Calais. Black Forest. Liege. Those are all names of streets in a Hollister neighborhood. I’ve often wondered why they were picked. They are also all names of cities and other locales where battles took place and treaties were signed during the Great War. The Great War? Sure you've heard of it. The Great War took place in Europe between 1914 and 1918. Yup. World War I. Oh-oh, sounds like a history lesson coming on. It'll be brief. This Tuesday, November 11, is Veterans Day. How many of you know that this holiday was originally observed as Armistice Day? On November 11, 1918, the Allies—which were France, Italy, the British Empire, the Russian Empire, and the United States—signed a truce with Germany to end that Great War. Hence, Armistice Day. People called that war the Great War because it was the largest, most devastating war up to then in history. Over 20 million civilians and military members were killed and another 21 million were wounded. Some teachers tell us we study history so that we can learn from our mistakes. Just what are we not getting right? Until 1938, when Armistice Day became a federal holiday, the President proclaimed a national observance every November 11. In 1955, federal legislation was passed to change the name from Armistice Day to Veterans Day. The reason was quite obvious—to honor the millions of veterans who had served in two more wars, namely World War II and Korean War. Since then, we have added to the veteran rolls, millions and millions more of men and women who had served in Vietnam, Persian Gulf War, Operation Iraqi Freedom, and numerous other military conflicts. Thank you, all! In Hollister, the local VFW branches will honor all military veterans from San Benito County with a parade through downtown. It'll take place at noon this Tuesday. 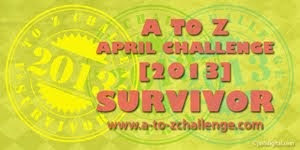 Check it out, if you happen to be there. If not, wherever you are on Tuesday, take a few minutes to reflect on all the courageous men and women who have served and are now serving in military services throughout the world. Also give pause to think about this thing called war, and another thing called peace. There’s a parade happening down San Benito Street this Friday afternoon. It’s the homecoming parade for Hollister High (officially known as San Benito High School). Yep, lots of energy going on in this town this week. Big election (Hurrah for President-elect Obama!) and homecoming week. The JV and Varsity teams will be playing Palma High School, from Salinas, for their last home game. FYI: The Hollister High varsity team is said to have the most unique mascot in the United States—the Haybaler or ‘Baler. I don’t know. I think the JV team’s mascot is rather matchless as well. It’s the Hayseed. To learn about how the ‘Baler mascot came to be, click here. 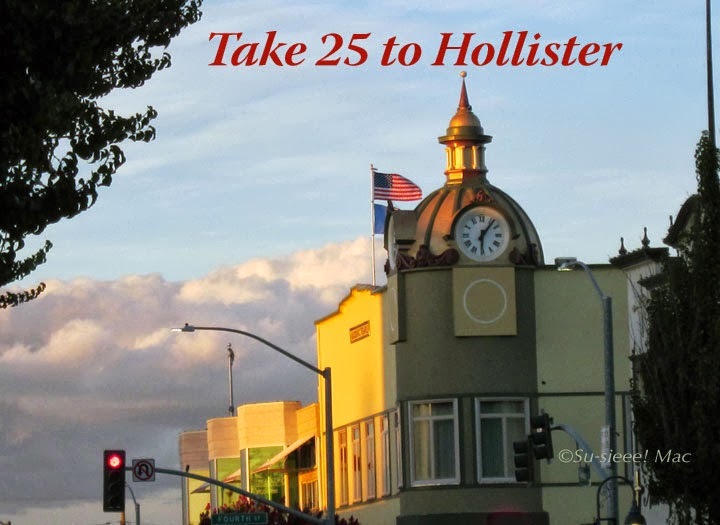 I haven’t been to a Hollister High homecoming parade in nearly 40 years. As a sophomore, I marched the mile or so of the parade barefoot as a bandaged up “Indian” holding an end of a blanket in which a fallen mate (made out of straw) laid. I was part of the Red Cross Club and we were pretending to be members of the opposing team who were clobbered by the ‘Balers. The other team had some kind of Indian mascot. I’m sure it didn’t make sense then either. Ah, the memories. 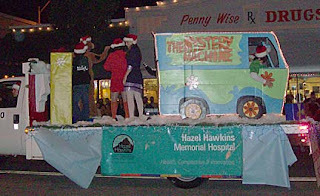 Anyway, if you happen to be in downtown Hollister this Friday, stay around for the parade if you can. It'll start at 2 p.m. The Pinnacle News published the results of its best of bests in San Benito County survey—aka the "2008 Pinnacle Awards"—last Friday. Click here to learn about the restaurants, stores, services, places, and events that Pinnacle News readers thought were the best. 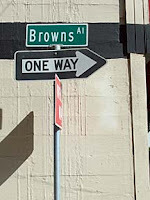 The next time you’re wandering in downtown Hollister, stop by Browns Alley. It’s on the west side of San Benito Street, between Sixth and Seventh. Right across from the Veteran’s Memorial Building, if you need me to be exact. And if you need to have even more precise directions, click here for those coordinates. 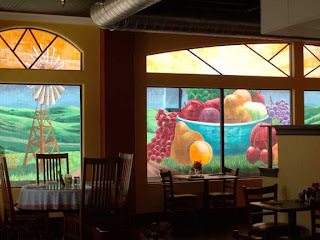 There, in Browns Alley, on the side of the historical Grangers Union Building, you can view a truly awesome mural that celebrates the agricultural heritage of Hollister, San Benito County, and, for that matter, the whole state of California. The mural was painted by students from the Gavilan College Art Department, under the direction of Muralist and Gavilan Art Instructor Arturo Rosette (also known as the artist r2row). 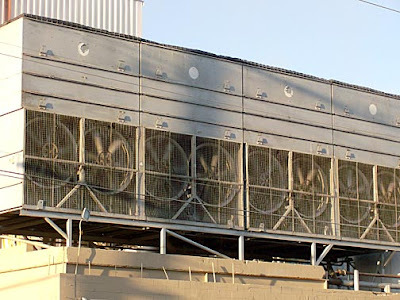 It was completed this summer. Because of the narrowness of the alley, it was difficult for me to get the full effect of the mural. The best view, I think, is from inside Knife and Fork, while sitting and sipping a cup of coffee. There are several murals to view in Hollister. For another downtown mural, click here.